I’ll be the first to tell you I don’t know too much about Filipino foods deeper than adobo, lechon and sisig. Although I’ve dated Filipino men, have Filipino friends, eaten Filipino foods and even my niece n nephew are half Filipino, I don’t think I’ve ever delved into see the wide flavor profile that’s offered in this unique country’s palette. I think it’s time I make a few friends take me on an eating binge so I can understand the food more. Until then I will tell you about a place I drove nearly an hour to find. Seriously, I drove an hour to this spot! Well to be honest, I was going through Vallejo to Napa for a friend’s birthday and on the way back we stopped in. 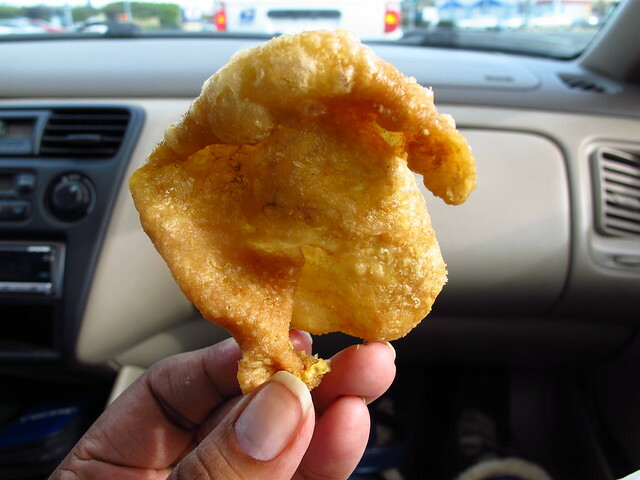 I had one place, DJ Bibingkahan, in mind with only one item to buy: Fried Chicken Skins. I learned about them from my girl Rosemary one day at dinner, she was telling a story about a friend who drove from Daly City to Vallejo just for some and my stomach was screaming at me to do the same! I got the name and location from her and was lucky enough to be in the area 2 weeks later. After enjoying an afternoon of wine tasting and a yummy lunch (post to come) with my sister and some friends, we were happy to learn that DJ Bibingkahan was located just off the freeway on our way home. SCORE! 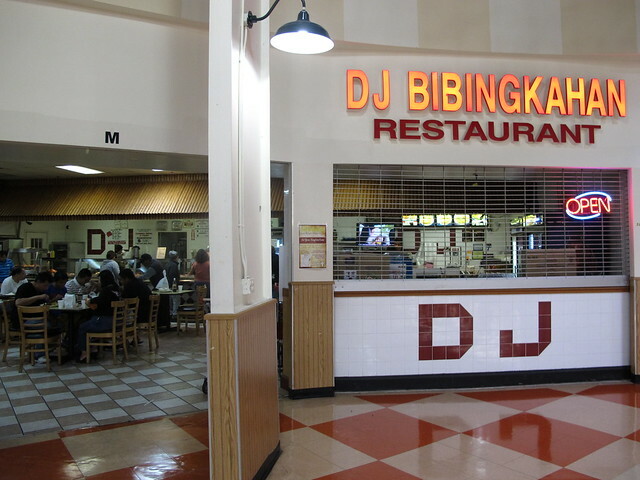 DJ Bibingkahan is its own restaurant in a small food court inside Seafood City, it had the largest steam table full of tasty Filipino bites I had ever seen. Too bad I didn’t grab a pictures, I was too fixated at the giant popcorn machine filled with fried chicken skins!! I nearly died looking at it, my arteries were clogging but all I could think about was shoving some into my mouth. We were both so full by then, but even my sister couldn’t resist buying a bag for herself and her family. 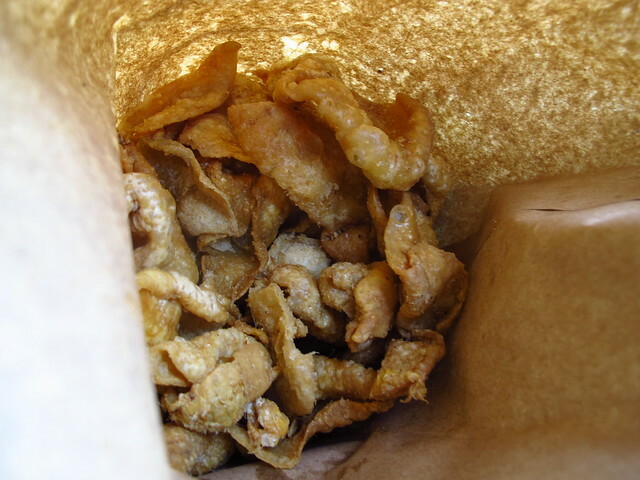 One pound bag, a little under $10 in cost, a few cups of chilli and garlic laced vinegar to go and we were back in the car with our noses stuck into the bag, greedily pulling out fat pieces of skins and eating a few on the ride home. 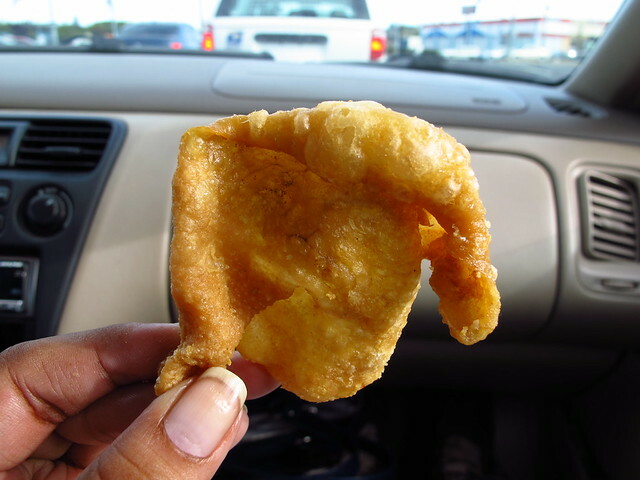 Hot and crispy, they’re like love and hate all in one bite. 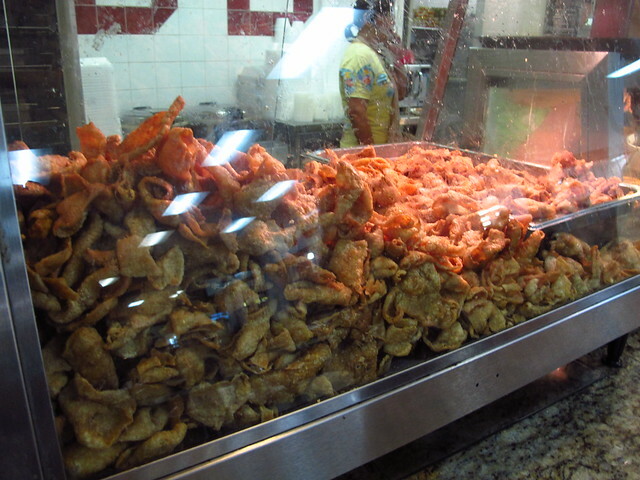 You hate yourself for loving something so bad for you, you hate yourself for dreaming of all the ways you can eat chicken skin on an everyday basis. When that bite is over, you hate yourself for loving it so much that you want more. Is it that serious you ask? Yea, it is! I would like to try more of their food and will as the time and opportunity to ride up to Vallejo comes up. I do make a mean version of Coconut Chicken Adobo that I had learned from a Filipino friend, maybe I should make and blog that as I continue to learn. Did I forget to mention that my brothers and father loved it so much, we finished that bag of skins about an hour after I got home? Yes we did, I didn’t get enough, next time, I’ll get 1 1/2lbs! With this post I am finally caught up with my 52 weeks, YAYY!! Week 6 of 52… CHECK! Next Post “Fall In Love With Me” Jambalaya!